The individual strengths and interests of each and every one of our district's 1,586 students contribute to the overall excellence that is Madeira City Schools ... their story is our story. Follow us on Twitter at #MadeiraStrong to learn what they care about, what they are involved in, and what they want to contribute to their corner of the world! 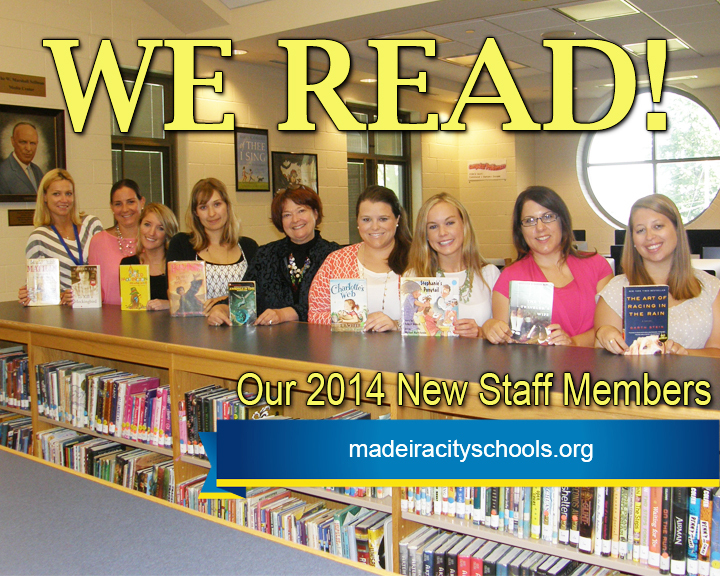 Madeira City Schools has an ongoing goal to increase literacy skills across the district’s curriculums. To show our passion for literacy and promote reading as a lifestyle, here's a selection of some of our district staff members with their favorite books! Pictured l to r: Jennifer Bracken, MES intervention specialist: Matilda; Laura Baker, MMS 6th Grade Math: To Kill a Mockingbird;Katie Stockton, MES Preschool: A Bear Called Paddington; Austin Sayre, MHS English: Harry Potter and the Deathly Hallows;Weslie Ostendorf, MMS Interim Principal: A Wrinkle in Time; Shelby Van Uum, MES 3rd Grade: Charlotte’s Web; Chelsea Farrell, MES 1st Grade: Stephanie’s Ponytail; Leigh Michelsen, MHS Business: The Time Traveler’s Wife and Jaclyn Preston, MES Preschool: The Art of Racing in the Rain. • Jennifer Bracken reads two to four books a month, but her favorite is Matilda by Roald Dahl. She admires Matilda for having a love for books and learning despite her upbringing. Today, reading helps her stay current in her field and allows her to be a life long learner. Other favorite books of hers are Oh The Places You'll Go, To Kill A Mocking Bird, Thinking in Pictures, House Rules and The Note Book. Since it began in 2006, Roald Dahl Day has been celebrated every year on September 13. To read more about this author please see Roald Dahl Day. • Weslie Ostendorf selected Madeleine L’Engle’s A Wrinkle in Time, because “The book is inspirational in setting up good vs. evil and showing that our weaknesses can also be our strengths - and who wouldn’t appreciate a dog named Fortinbras?” Of the influence reading has had on her life, Weslie says, “When I was young, my family did not have money for travel or many extras, but with my library card I could explore the world; the opportunity to learn became endless.” Today she often downloads free books and audiobooks from Hamilton County Library. • Shelby Van Uum’s parents had a bookstore where she spent hours and hours reading her favorite books as a child. Charlotte’s Web by E. B. White, is the first chapter book she read with her parents, and she’s looking forward to reading it out loud to her third grade students this year. In a poll of librarians, teachers, publishers and authors, it was voted the number one children’s book. To read how it came to be, see The Story of Charlotte's Web. Shelby has met some famous authors; Jack Perlutsky, Jamie Lee Curtis, Chris Van Allsburg, John McCain, Stephen King, Hilary Clinton and Jenna Bush. • Chelsea Farrell is currently getting her Masters in Reading so peruses textbooks and articles, but still reads several books a month. Her favorite, Stephanie’s Pony Tail, was written by Robert Munsch and stresses the importance of being yourself. She also reads history books and nonfiction texts and books and is now reading The True Diary of a Part-Time Indian. Please see Robert Munsch for other books by this author. Random House launched Choose Kind, an online anti-bullying campaign inspired by the book designed to encourage students, educators, families, and readers of all ages to combat bullying by practicing everyday acts of kindness. 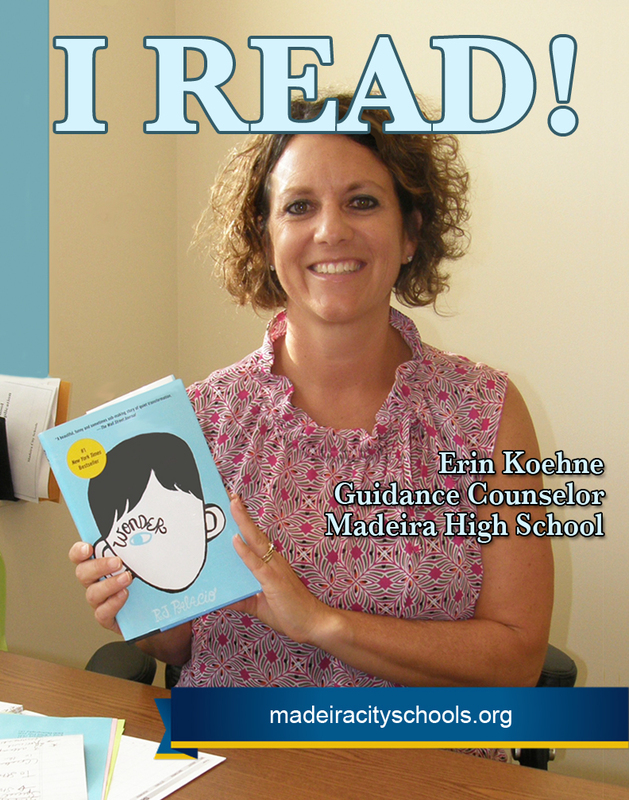 Reading has been an important part of Mrs. Koehne’s life and has helped her to grow as a life long learner. Her other favorites are Me Before You by Jo Jo Moyes, Hunger Games by Suzanne Collins, Carry On Warrior by Glennon Melton (who she has met!) and Secrets of a Happy Family by Bruce Feiler. 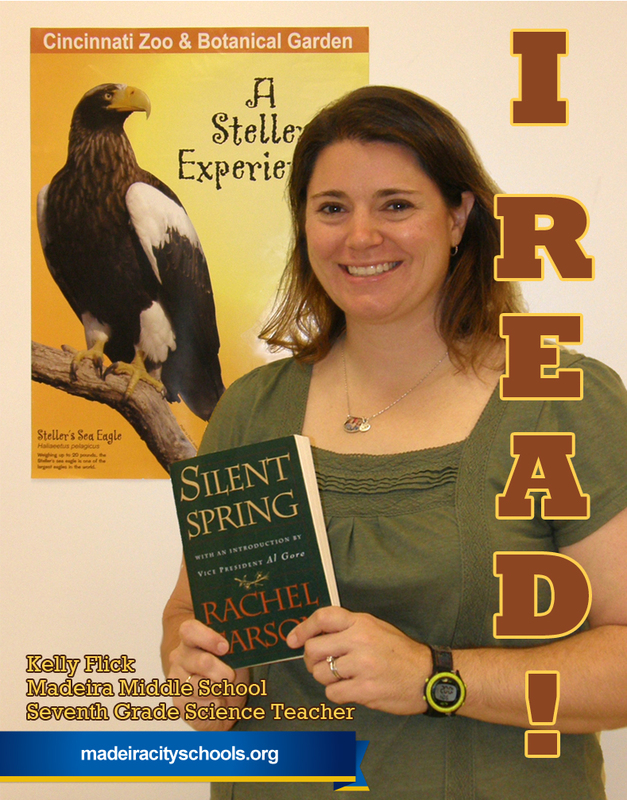 Madeira Middle School Seventh Grade Science teacher Kelly Flick chose Silent Spring, a book written by Rachel Carson in 1962 that describes how DDT entered the food chain and contaminated the entire world food supply. The book resulted in a public outcry that eventually led, in 1972, to a ban on the agricultural use of DDT in the United States which saved the bald eagle and the peregrine falcon from near-extinction. Mrs. Flick appreciates author Rachel Carson for blazing a trail not only for female scientists, but also for the environmenal movement. Her other favorite authors are Jane Austen, Dr. Seuss, J.R.R. Tolkien, Agathata Christie and Michael Crichton. Of reading Mrs. Flick said, "The more I read, the more I learn and the better I feel about being a good mother and teacher." 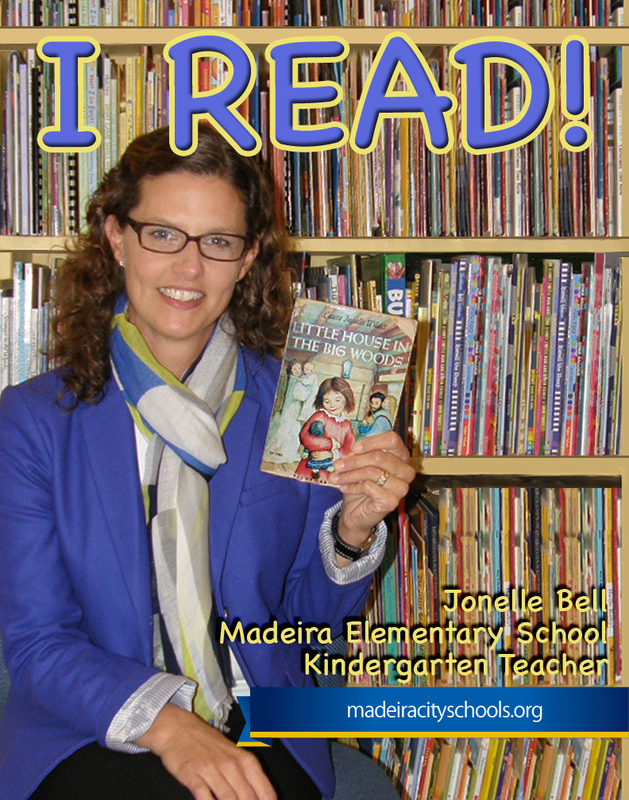 Madeira Elementary School Kindergarten teacher Jonelle Bell shared the copy of her favorite book given to her by her third grade teacher, Mrs. Banion. As a child she loved all of the Little House on the Prairie books but selected Little House in the Big Woods, byLaura Ingalls Wilder, as her favorite. Mrs. Bell enjoys books written by Liane Moriaty and is currently reading her book Big Little Lies, as well as Guided Math by Laney Sammons - but her favorite authors are her Madeira Kindergarten students! She and our other Kindergarten teachers have instituted a Book Lovers Club in their classrooms to instill the importance of reading every day, and of taking care of books. 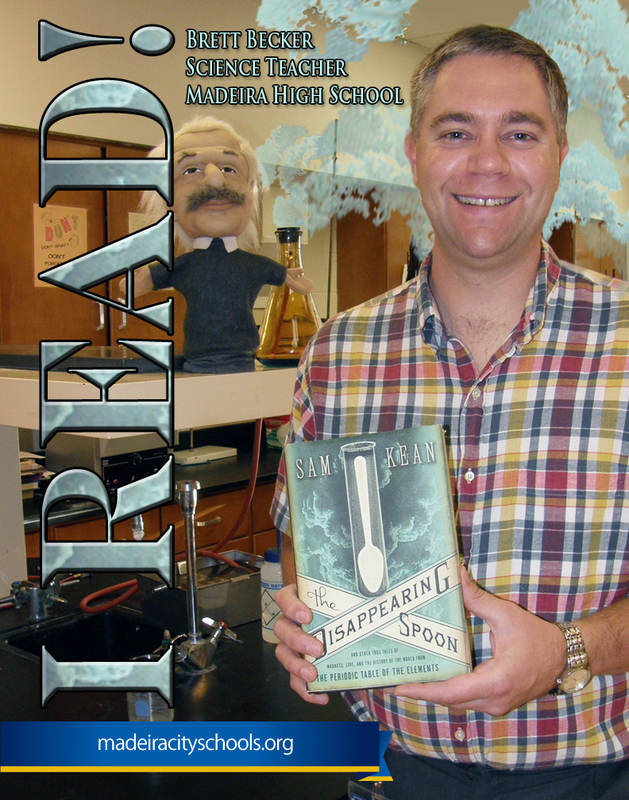 MHS Chemistry teacher Brett Becker selected The Disappearing Spoon, by Sam Kean as his favorite. The collection of tales "follows every element on the periodic table as they play out their parts in human history, and in the lives of the (frequently) mad scientists who discovered them." It's Mr. Becker's favorite book because, "Who wouldn't want to read a book of fascinating stories about the elements that make up the universe?" Author Bill McKibben also reviewed the book and stated, "If you stared a little helplessly at the chart of the periodic table on the wall of your high school chemistry class, then this is the book for you." Mr. Becker has met several authors, who coincidentally are his co-workers at Madeira High School; Bob Kitchen and Jon Unger. He's currently reading Jim Henson: The Biography and said "reading pushes him to ponder the ponderables and appreciate various stations in life." 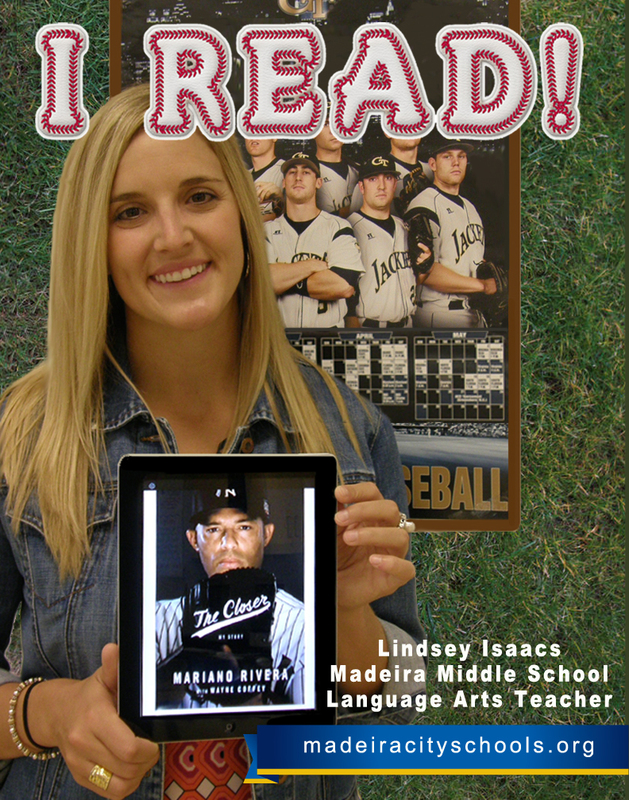 Baseball is an important part of her life, so Madeira Middle School Language Arts teacher Lindsey Isaacs selected The Closer byMariano Rivera. Rivera journeyed from growing up as the son of a poor Panamanian fisherman to becoming perhaps the greatest relief pitcher of all time playing for the New York Yankees for 19 years. When he was discovered, he had never flown in an airplane, had never heard of Babe Ruth and spoke no English. Ms. Isaacs’ brother Dusty (pictured on her poster under the A in ‘READ’) has played baseball for 15 years and is currently a closer in the minor leagues as part of the Toronto Blue Jays organization. She naturally enjoyed discussing the book with her brother and says “Rivera’s amazing life story and major league successes and failures makes for a great read for any baseball fan.” The book has also been printed in Spanish and Young Reader’s versions. Her favorite book is the first in our series to be displayed on an iPad! Pros and cons of E-readers versus books can be found here. 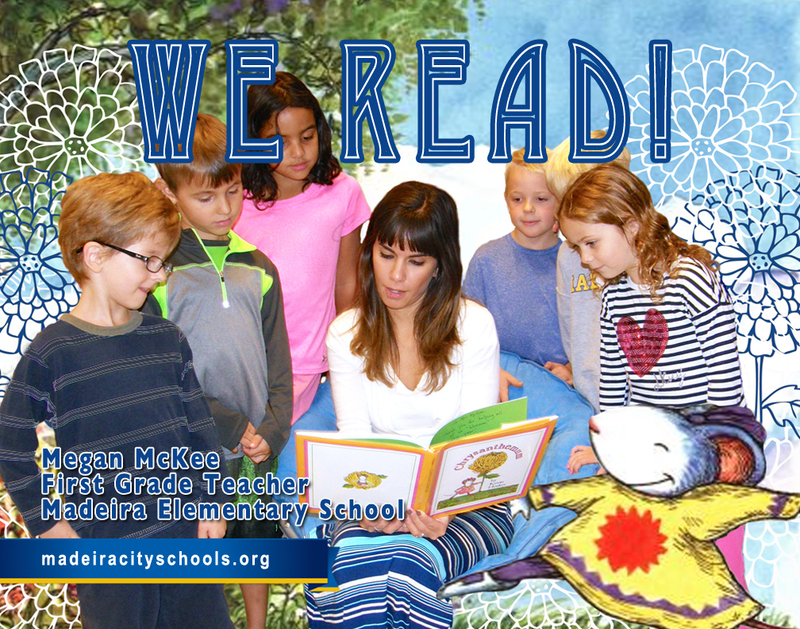 Megan McKee is passionate about literacy! She wants the students in her room to truly love reading and to share how the adults in their lives love reading, so she started a “Mystery Reader” program. Parents, grandparents, siblings, aunts or uncles sign up to be guest readers, then send in five clues about themselves. The students guess who the mystery reader is and on Friday the special guest comes in and reads to the class. What a special way to share the love of reading with kids! Mrs. McKee chose Chrysanthemum, by Kevin Henkes, as her favorite book because it shows children the importance of being kind to one another and helps build a positive community in her classroom. Chrysanthemum (pictured in the bottom right hand corner of their 'WE READ!' poster above) loved her name until she started school when kids made fun of her being named after a flower. But when the students got a new music teacher named Mrs. Delphinium Twinkle, Chrysanthemum blossomed. The book received several awards: ALA Notable Children’s Book, Horn Book Fanfare, NCTE Notable Children’s Trade Book in the Language Arts and in 2012 was named #66 on the School Library Journal's list of Top 100 Picture Books. 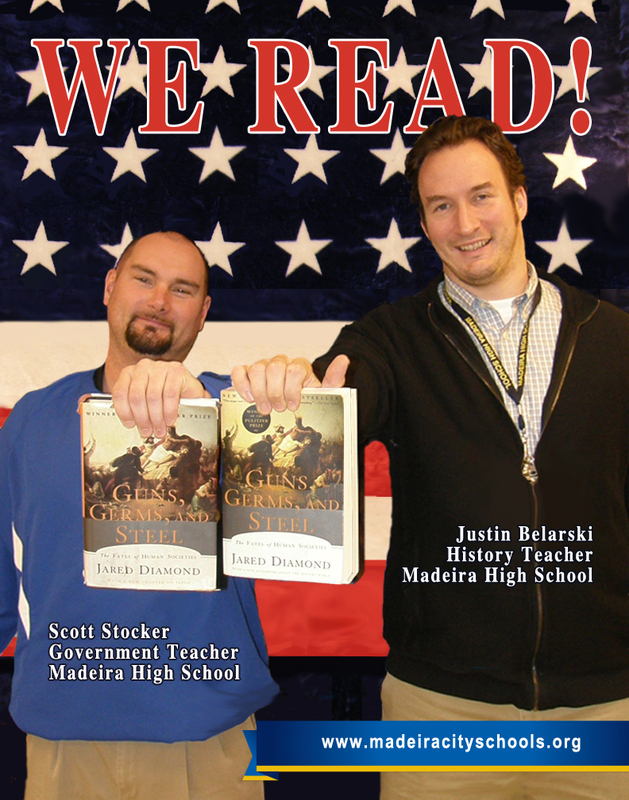 Scott Stocker and Justin Belarski both teach Social Studies at Madeira High School. They also both selected Guns Germs and Steel, by Jared Diamond, as their favorite book. Jared Diamond argues that geographical and environmental factors shaped the modern world. Societies that had had a head start in food production advanced beyond the hunter-gatherer stage, and then developed religion - as well as nasty germs and potent weapons of war -- and adventured on sea and land to conquer and decimate preliterate cultures. In 1998, the book won the Pulitzer Prize for general non-fiction and the Aventis Prize for Best Science Book. A documentary based on the book, and produced by the National Geographic Society, was broadcast on PBS in July 2005 and can be seen at Guns, Germs and Steel. 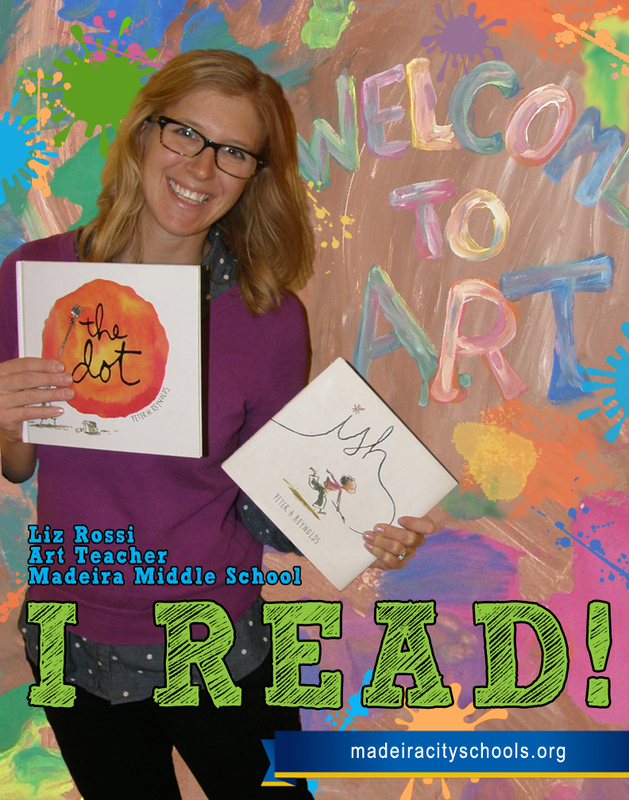 Madeira Middle School art teacher Liz Rossi chose two books about children who are afraid their art isn't "good enough." The author of those books, Peter Reynolds, wrote “The Dot” and its sequel “Ish” to change that as part of his goal to make the world a more creative place. The Dot has been printed in many editions, translated into foreign languages, and was made into an animated film. To read how the book even traveled into space! please see Stellar Cafe. Reynolds' books Ish and Sky Color complete a “Creatrilogy Series” that celebrates the power of original thinking. Reading has always been an important part of Miss Rossi’s life and as a child visited the library with her mother to pick out Nancy Drew books. She loved the fact that a young girl was the main character in that series, and she was smart and courageous. Reading is still an important part of her and she enjoys discussing the books she’s reading with other people, and hearing how other people interpret and react to it.